The equation of a curve is . i. Express in the form , stating the numerical values of and . ii. Hence, or otherwise, find the coordinates of the stationary point of the curve. iii. Find the set of values of for which . The function g is defined by for . iv. State the domain and range of . Coordinates of the vertex are .Since this is a parabola opening downwards the vertex is the maximum point on the graph. Here y-coordinate of vertex represents maximum value of and x-coordinate of vertex represents corresponding value of . For the given case, vertex is . Therefore, least value of is 16 and corresponding value of is 4. Vertex of a parabola is a stationary point on the curve. Hence the critical points on the curve for the given condition are -2 & 10. 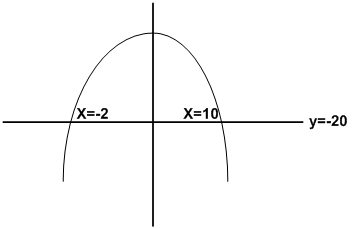 Since, as demonstrated in (ii) it is an downwards opening parabola. Domain and range of a function become range and domain, respectively, of its inverse function . Therefore, if we have domain and range of , we can find domain and range of . The given function is for . The set of numbers for which function is defined is called domain of the function. The set of values a function can take against its domain is called range of the function. · Substitute various values of from given domain into the function to see what is happening to y. · Make sure you look for minimum and maximum values of y by substituting extreme values of from given domain. We can find range of for as follows.